•Start winter cleanup of the lawn when the grass is no longer sopping wet and planting beds stop being a sea of mud. Rake your lawn to get rid of dead growth, stray leaves, twigs and winter debris and let light and air to the soil level, encouraging the grass to grow. This may be a ways off but soon! •Re-seed bare or damaged patches of lawn. Scratch up the soil with a rake first. Mix a shovel of soil with a couple of scoops of grass seed and spread in the patch you’re fixing. Rake level and keep well-watered until seeds germinate and the new grass establishes. •Remove tree guards or burlap winter protection from any young trees or shrubs. Try not to leave tree guards in place over the summer. They keep rabbits and mice from nibbling on tender bark over the winter, but trees don’t need them in summer. They don’t allow enough air movement around the base of the trunk and that can promote rot of the bark. •Transplant any existing shrubs you want to move before they begin to leaf out. •Weeds start growing vigorously early, so when you spot them, go to it. Getting on top of the weeding now means a lot less work later. Weeds are easier to pull out while their roots are still shallow in early spring. 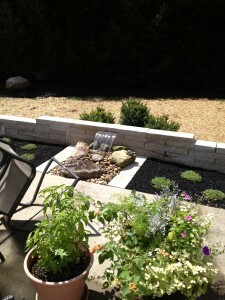 Why work with a professional Landscape Designer? Hiring a professional landscape designer could be one of the smartest investment decisions you’ll ever make. Designers trained and qualified in the principles of garden design and horticulture can help their clients avoid the costly mistakes that can turn the dream of an outdoor haven into a landscape nightmare. Professional landscape designers are skilled practitioners of fundamental design concepts – proportion, unity, balance, perspective, color, texture – that can bring about a fully integrated design. They have a comprehensive knowledge of plants so that you get the right plant that grows to the right size for the right place in your garden. They are skilled communicators and planners who work with contractors, vendors, local governments and others to complete successful projects. Professional landscape designers are also aware of our natural environment and promote sustainable practices whenever possible. They are inspired by the creative process, by great design, and most of all, by their clients’ needs, wants and dreams. Its what I do every day! Contact me for a free consultation to get your dream project started this year! Designing a landscape with purpose has never been more important. Budgets are tighter than ever for homeowners. Thought and insight into common problems and solutions are essential. First, what is the area to be improved? Second, what is the overall goal for the space? Third, what does the client what to gain from improving the space? All important, but also important, what can be done for the allotted budget? Village Landscapes works with each client to determine how best to utilize our expertise and our clients’ wishes into a functional, purposeful design. 1. A design needs to work with the space in question-if it is the back of the house, then the design needs to focus on common but practical solutions to this area. 2. A design needs to be appropriate-A huge waterfall or over-sized trees don’t work in a 10’X10′ space. 3. A design speaks to the client-“I see now what you were talking about. I like the ideas set forth in the design’. 4. The design needs to be a team effort-both the designer and the client need to be a cohesive unit. Mention this ad and receive 10% off any lawn and or landscaping maintenance packages for 2014! This could save you hundreds of dollars in one year. 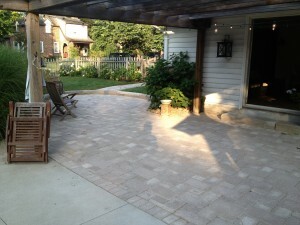 Call Jeff at 740-404-3855 to schedule a free consultation at your home or business! Pond less waterfalls make for a peaceful and calming affect in today’s hectic world. They provide you with the feel of a real waterfall that lasts all year long without any concerns of maintaining a pond to go with it. 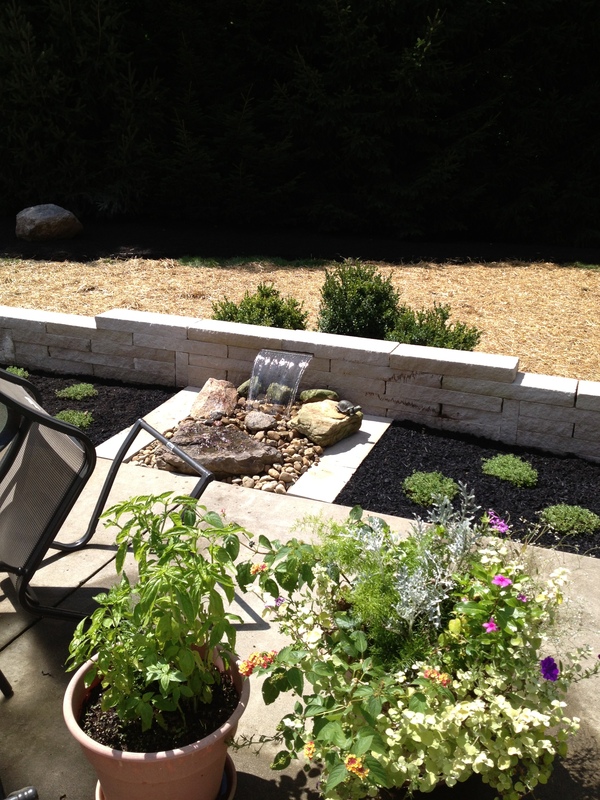 There is dramatically less maintenance than a traditional pond and it costs much less to install. I have installed some for clients and they have reported a much more enjoyable landscape, sitting outside listening to the music of the water splashing over the rocks. A real sense of calm in today’s crazy world! Call today for a free quote!.